You may have dozens of images that need to be uploaded at once to your online locker (parent accounts do not have a digital locker). Rather than uploading photos one at a time, you can easily drop entire albums into a zip folder and upload them in one go. Please be aware that, while locker space is unlimited, we can only accept files as large as 500 megabytes, so if your zip folder exceeds this size, try making a few smaller zip folders. Open a folder, browse to the images you want to upload, select them all (click and drag with your mouse). Right-click one of the files. 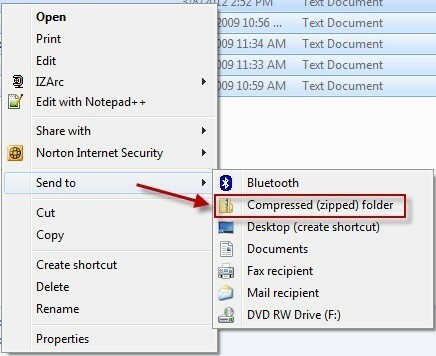 Hover your mouse over the Send To menu and select Compressed (zipped) folder. After clicking this, the zip file is created; you can enter any name you wish. It is now ready to be uploaded. Navigate back to this file to upload the image album in School Loop. Highlight the files you want to compress. The zip folder will then automatically be created in the same folder and can be renamed to anything you wish.